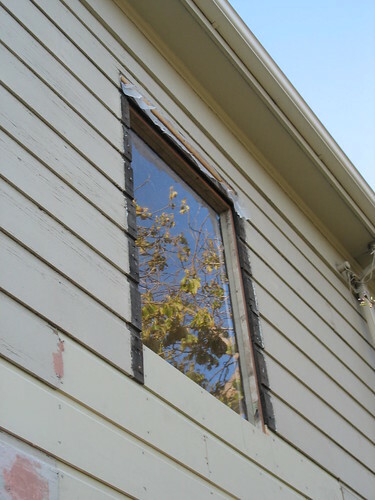 House Adventures: OK, now this is a "window"! OK, now this is a "window"!, originally uploaded by berkeleygal77. There has been a gaping hole where the kitchen window should be for quite some time now. I'm sure some of you have seen the pictures. The window I want/need takes a long time (read 6 weeks) to order/get delivered. So, in the meantime, I have a sheet of plastic less than 1/2 an inch thick to plug the hole. This is proof - gaping holes don't usually reflect the trees from across the street - at least not in my experience.